It was quite cold when we arrived in Florida in mid-January 2019 but once the weather got better we took a few day trips from our house in February. Much of Florida is wild and empty. 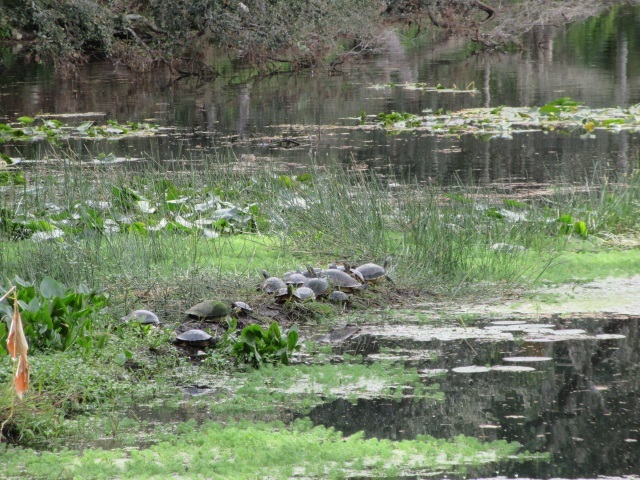 The Florida State Parks system showcases the best of this wilderness and some historical monuments with over 190 parks spread throughout the state. For a modest entry fee per car, you get a map of roads and hiking trails at the entry gate and can then drive to the visitor center where there is usually an exhibition and often a food service (probably only burgers). There are well-equipped campgrounds for motor homes and tents, but in some you can rent a cabin or pitch your tent in the backcountry (with a permit). Park rangers and volunteer staff are always very friendly and helpful. Lake Louisa State Park is under an hour’s drive north from our house. We had been there before but only to have a picnic by the big lake. We decided to tackle a 3-mile hiking trail and set off walking through the typical Florida scenery with trees and open spaces of grass and scrub. The scenery changes in Florida with a very short change in the elevation. You can be walking by a swamp and go up just a very few feet and find yourself on firm ground. 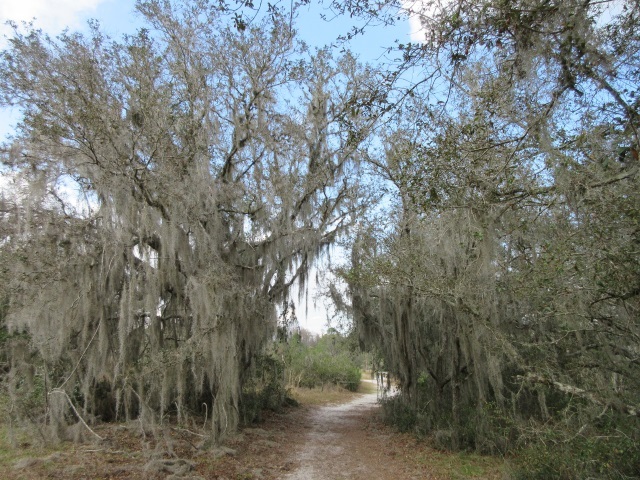 Most of the trees are covered in Spanish moss which we really like. It is not actually a moss, but an epiphyte or bromeliad which lives off rain and airborne dust etc. We learned later that it can harbour a nasty bug which can burrow into your skin. That’s probably why it’s removed all the time from the trees on Southern Dunes where our house is. After a while realised that this trail was 3 miles one way and it wasn’t clear how we would get back to the car. We decided to turn back when we reached a small stream which we would need to wade through. You do have to be a bit wary of snakes although we have rarely seen them in Florida. Martin took a slightly diferent route back from me and saw a deer. I didn’t see any wildlife but there was a warning sign on the road, and of course one by the lake. Back at the car park we had a snack on the beach by the lake and watched the sunset. We had walked about 4 miles in 2 hours and it was about 85 F.
This is the major garden in Orlando. 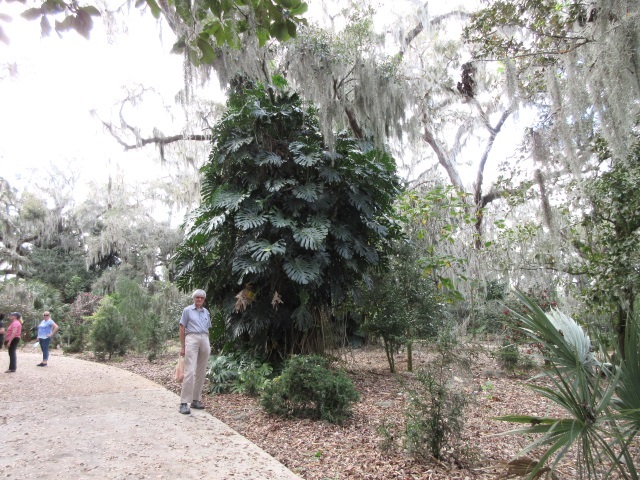 It’s about 50 acres including the lake, and was created by Harry P. Leu and his wife who travelled all over the world bringing plants back to their house. They deeded their house and garden to Orlando in 1961. We went there many years ago before we started to create a tropical garden at our house. This time we recognised a lot more of the plants. 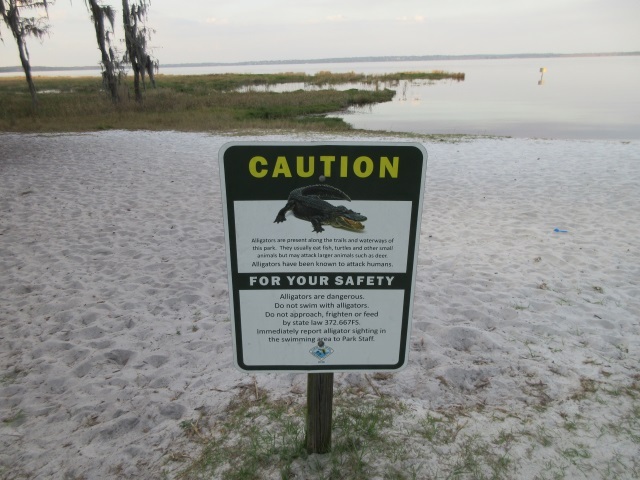 There’s a nice walk round on easy paths and a lake where we had seen small alligators on our previous visit. This time we saw only a group of turtles sunbathing just outside the water. A brown-coloured owl stared down at us from its perch in a tree. From the Internet I identified it as a barred owl. 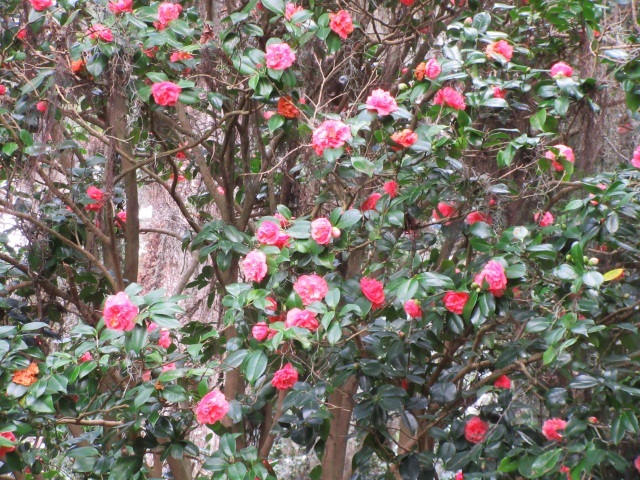 The garden is renowned for its 2000+ camellias with over 240 cultivars. Many were still in flower but we were just a bit late in the season to see them at their best. 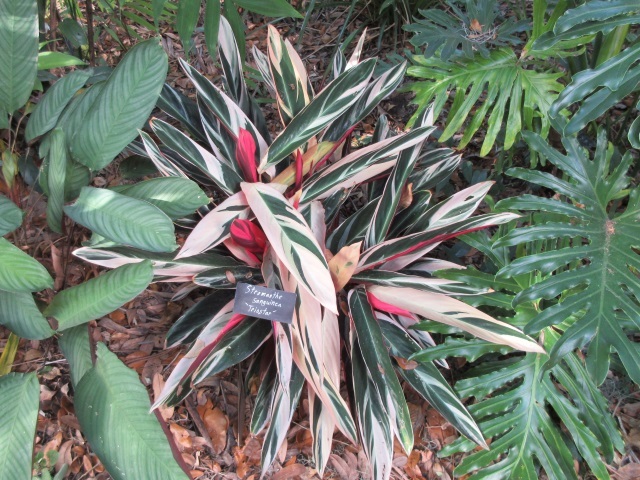 The bromeliads were excellent and they have several thriving specimens of the beautiful green, cream and pink stromanthes which we have been trying to grow at our house – this plant suffers in frost which can occur once or twice a year in central Florida. Some of the plants are huge. This garden is a pleasant oasis in suburban Orlando. It’s easy to get to it and to park outside. Our friend Nancy came down from New York to stay for 4 days. 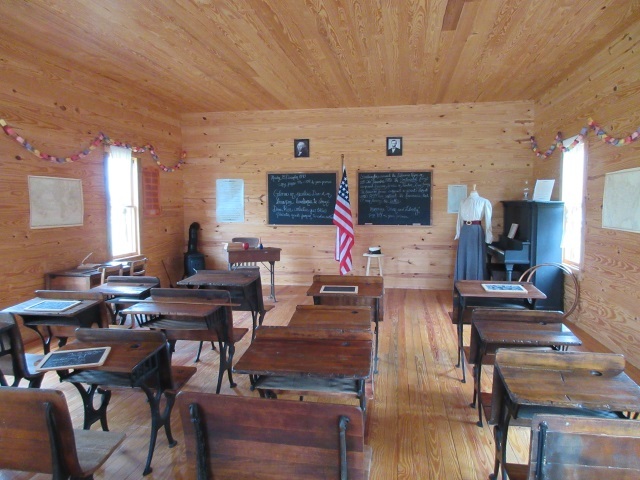 We had made various plans but the weather forecast was not good for our first full day together and so we decided to stay close to home and visit the pioneer village just outside Kissimmee. This contains a number of early (i.e. 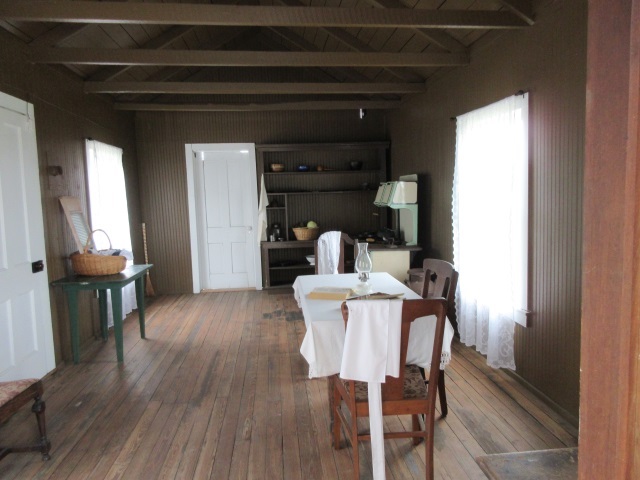 very late 19th century) buildings constructed by some of the first settlers in Osceola County. All the buildings have been moved to the village from elsewhere in the county. There are four houses, one of which, belonging to the Tyson family, had only one room, even though they had eleven children. A larger house built by the Cadman family who were originally from Yorkshire has several rooms and is furnished. They lived in it until 1980. Cattle ranching was an important business at that time – there still are plenty of cattle in Florida. The citrus industry also got going at the end of the 19th century. Helpful information boards described the role of these families in setting up these industries. 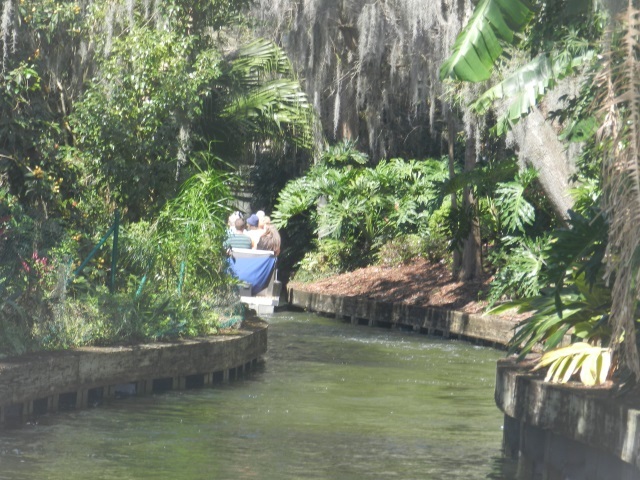 With summer temperatures in the high 90s F, life must have been tough for the early settlers with no refrigeration, no air-conditioning, and plenty of mosquitoes as well as snakes and alligators to deal with. There are replicas of a train depot, a church and a schoolhouse which did look rather familiar to those of us on the wrong side of 70. The site also has a replica Seminole village which shows how the original inhabitants of central Florida lived before the arrival of European settlers. Like many similar places in the US the village is run entirely by volunteers. The sign boards are excellent. The forecast rain didn’t come. We went into Kissimmee for lunch and ate a nice quiche at a place which described itself as a tea room. Saying that it was “overstuffed” (a favourite word with American furnishers) with decorations would be an understatement. Christmas decorations seemed to be everywhere. The owner was very pleasant but we did have a conversation with him about making tea. There was a teapot, a rare object in the US, but it only contained hot water to go with a biggest choice of tea bags I have ever seen, but no Yorkshire tea. 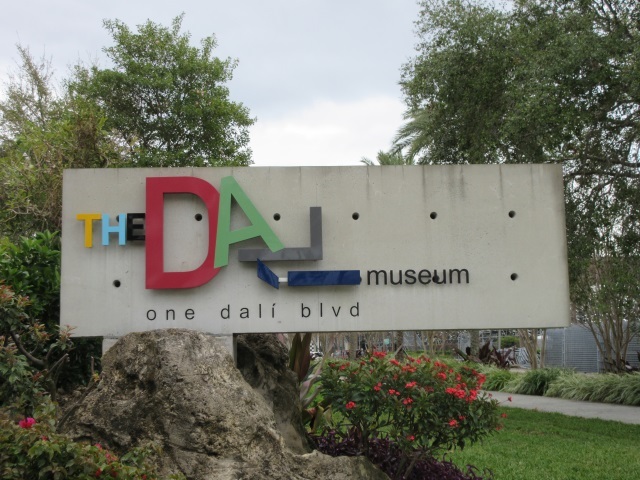 Rain was forecast again the next day and so we decided to drive the 80 or so miles to visit the Salvador Dalí Museum in St Petersburg. We had all been there before but they now have a completely new building not far from where the old one was. Once you get past the traffic on the interstate in Tampa it is easy to get to St Petersburg where there is little traffic on the wide streets and plenty of parking. The museum was very busy indeed. We decided not to join a group tour but instead used the excellent iPod-based audio guide which also shows a photo of each picture which is being described. Martin and I went to the Dalí Museum in Figueres and Dalí’s home in Port Lligat in north-east Spain in 2013 and what we had seen and learned there helped us to understand more about this strange and eccentric artist. There was also a special exhibition of Dalí and Magritte who were appeared to be competing with each other to create the weirdest painting. 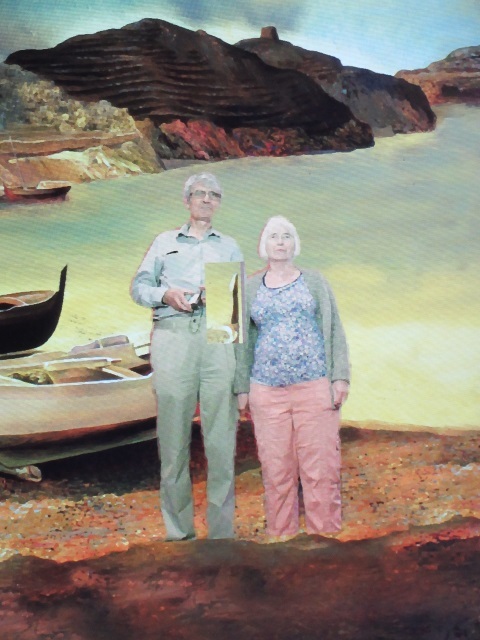 In this area we played with a digital tool which allowed us to appear to be part of a Dalí painting. The museum has one downside, a cafe which is much too small for the number of visitors. We decided to eat there as we fancied some Spanish food but had to wait a very long time for a nice tapas meal. It being America, the gift shop was huge with some lovely and rather expensive souvenirs. The promised rain finally arrived in a downpour just as we were leaving but it didn’t last long. After a visit to Haslam’s, which is the largest independent bookstore in Florida, where we managed to buy only one book, we had dinner outside at 400 Beach, a very nice restaurant by the marina. The weather was very much better on Nancy’s last day with us and so we went back to plan A and did something we have never done before in Florida which was to take a train. 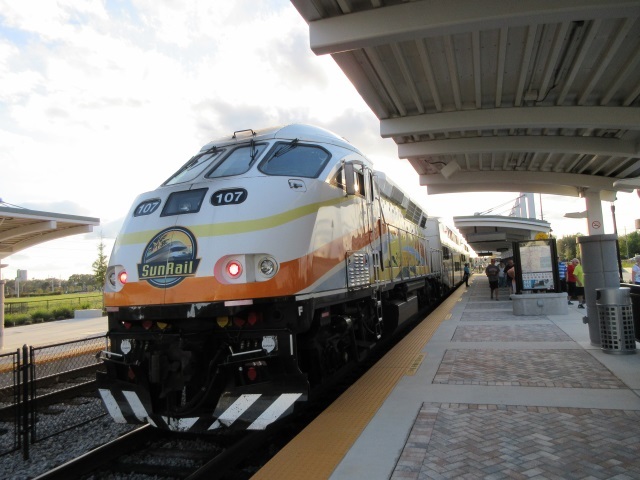 A new commuter rail service called, not surprisingly, Sunrail opened in central Florida last year. It goes from Poinciana just south-west of Kissimmee right through the downtown part of Orlando to various commuter towns north of the city. There are just a few trains outside in the rush hour. We arrived at Poinciana Station in good time to find the platform crowded with grey-haired snowbird seniors taking a day out. This train is amazing value, $2.75 roundtrip for seniors for a journey of 50 minutes each way to Winter Park. The train is double deck and we went past parts of central Florida which you don’t see from any of the major roads. Almost everyone was going to Winter Park which is where the wealthy built their mansions so that they could escape the winter cold in the north. 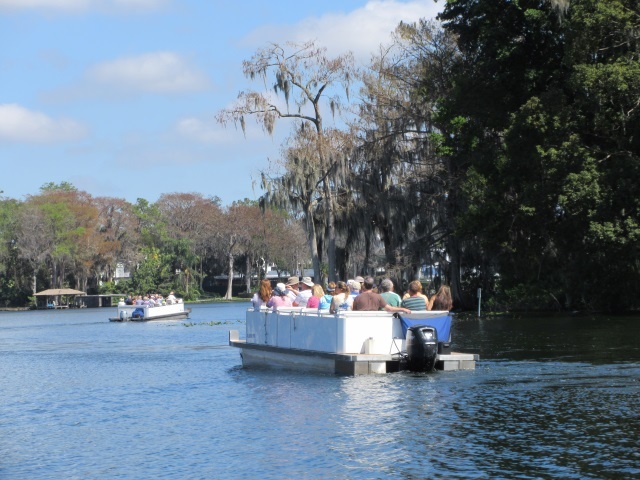 A very short walk from the train station takes you to an excellent narrated boat tour where you can see the huge houses and also the buildings of Rollins College, one of the best-known colleges in southern US. The guide said that a number of the houses had been pulled down and rebuilt even bigger. The boat visits three different lakes, going on narrow canals between them. This is definitely not a trip for a bad day as the boats have no top as the bridges over the canals are so low. 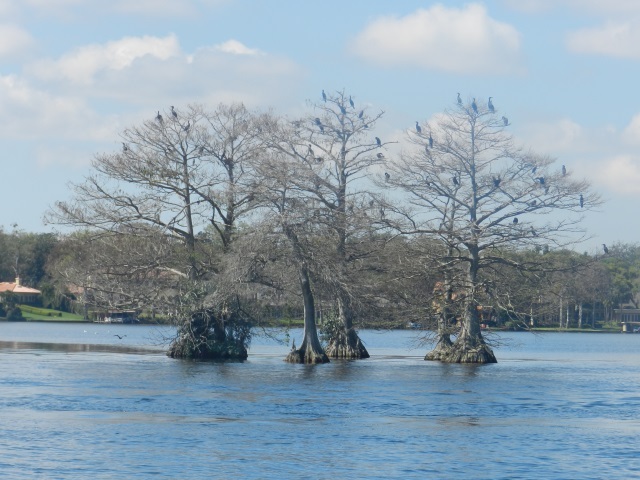 We saw some cormorants perched in three trees in one of the lakes. After lunch at a Turkish restaurant we went to the other major tourist attraction in Winter Park which is the Morse Museum of American Art. 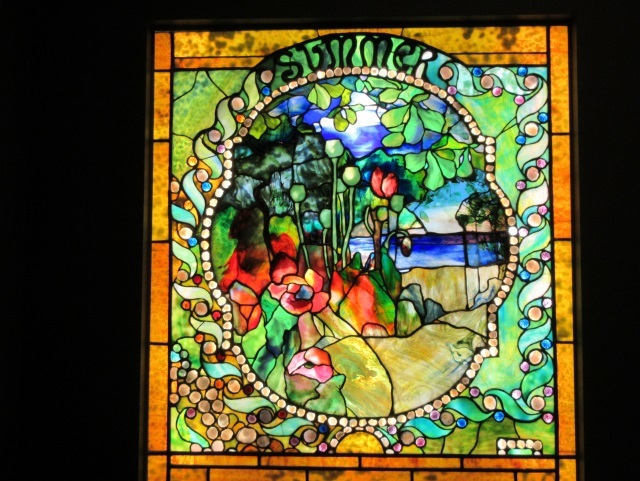 This building houses a large collection of works by Louis Comfort Tiffany, he of the coloured lampshades and the posh jewellers on Fifth Avenue, New York. Besides the lampshades there were many stained glass windows and mosaics and some excellent glass vases. There are even tops of columns decorated with glass daffodils. 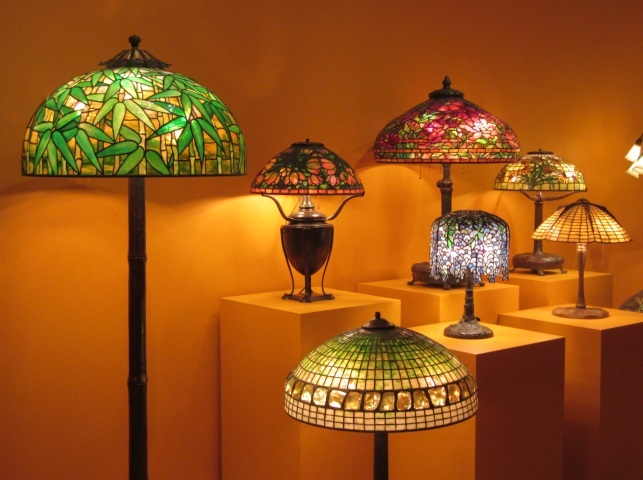 Many of the pieces came from Tiffany’s Long Island home Laurelton Hall. This includes a chapel interior created by Tiffany for the 1893 World’s Columbian Exposition in Chicago. After this event finished the chapel was re-installed in a separate building on the Laurelton estate. After the hall was destroyed by fire in 1957 the founders of the Morse Museum Hugh and Jeanette McKean moved the chapel to the interior of the museum. 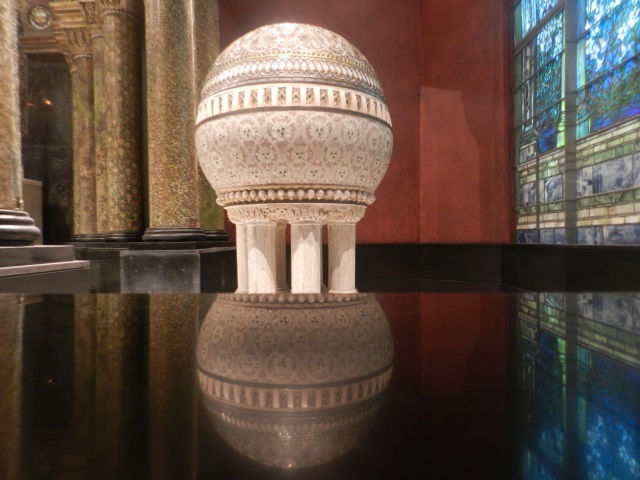 The glasswork in it is stunning, especially the globe-shaped font. There is no audio guide at this museum but instead a pile of well-designed and well-written small leaflets in each room. You can take these away. I really really like the Tiffany stained glass and ended up buying a big book about it. There were some real commuters on the train back and some of them had bicycles. It seems that the new train is beginning to solve a few of the traffic issues in central Florida. 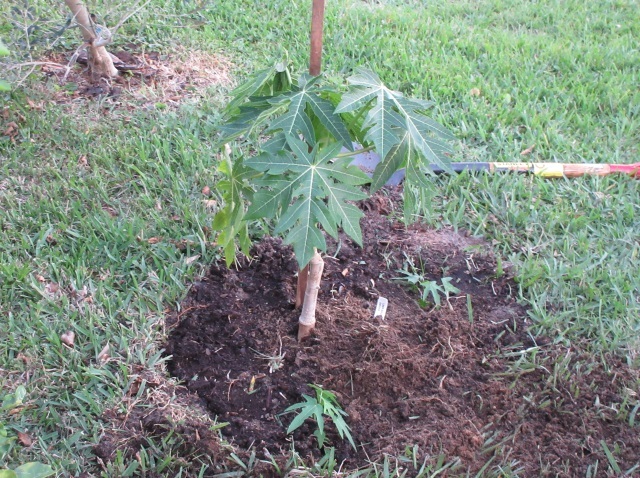 Our efforts to grow a papaya tree continue. There are several others now in gardens nearby, but the one we planted in November had fallen over when it got to about 4 feet high. However I did plant some seeds from a fruit we ate in November and when we arrived in January there were about 50 4-inch high papayas in two pots. We bought another plant after we came back from the Dominican Republic and the weather had warmed up, and planted it in a different place accompanied by 2 of the little ones. 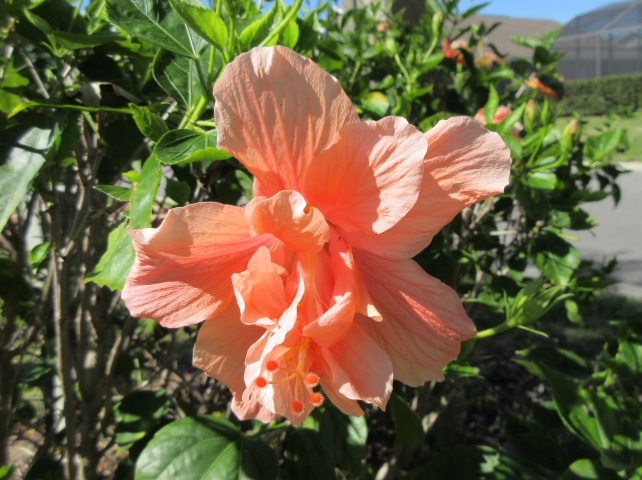 The hibiscus and azaleas were in full flower in February and we even had some flowers on our bougainvillea which is still quite small. You need to be careful with these plants as they are prickly. There was plenty of blossom on the lemon tree, and a few lemons, when we left and my olive tree was now taller than me. The avocado I grew from a stone was 10 feet tall in January. From our pool deck you can just see some of our tropical fruit trees and little papaya pots on the left here. 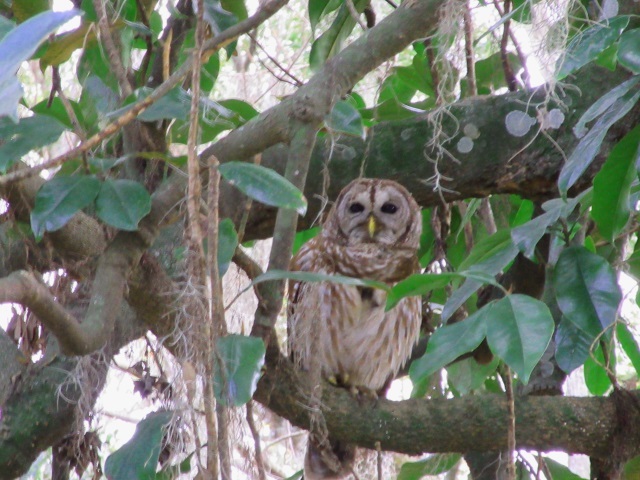 This entry was posted in Uncategorized and tagged barred owl, boat tour Winter Park, Cadman family, camellias, Central Florida, Dalí Museum St Petersburg, Harry P. Leu Botanic Garden, Hugh and Jeanette McKean, Lake Louisa, Louis Comfort Tiffany, Morse Museum of American Art, Osceola County, papaya tree, Pioneer Village at Shingle Creek, Salvador Dal&iacute, Spanish moss, stained glass, stromanthe, Sunrail, Tiffany lamps, Winter Park Florida. Bookmark the permalink.